Ever had days when life seems to throw everything at you, so every free moment you get, you’d rather spend it communing with your bed? That’s what my life has been for the past few weeks, which explains the lack of updates. Lots of things happening both with work and with my personal life. Been trying to get it back under control but it’s easier said than done. My version of a Happy Meal. No toy needed. 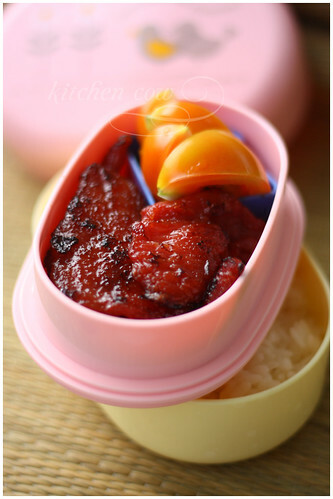 In the meantime, let us take in the gloriousness of a tocino lunch from weeks back. Tocino, a cured Filipino breakfast meat, has that sweet-savory thing pinned down perfectly. Originally from Pampanga, this wondrous dish is so fantastically nyummy that the whole country has claimed it as part of their repertoire. While purists will claim that the best tocino hails from Pampanga, it’s easy to find some at most “sinangag + itlog” all-day-breakfast places, served with the ubiquitous sinangag at itlog. I like it with tomatoes (as seen in my lunch) but it’s wonderful with a little vinegar too, adding sour to the sweet-savory equation. Of course, a runny egg yolk slowly spreading on freshly sauteed sinangag is wonderful as well. It’s heavenly being Filipino when it’s breakfast time, don’t you agree? I’ll get around to answering your comments, promise! Just let me get back on my feet first. Looking to make your own tocino? Wander over to Ibyang’s A Wife’s Charmed Life and try the recipe passed down in her family. This entry was posted in bento and tagged almusal, bento, breakfast, cured pork, filipino, filipino food, ham, obento, pinoy, tocilog, tocino. Bookmark the permalink. 10 Responses to I love Tocino! I’m not from the Philippines but I agree — tocino rocks! Yum yum yum. I love tocino too! yum! Love love Tocino and its sweet sauce, oh and the longganisa too!